Longueval is a village some 20km south of Arras and 10km north east of Albert. The British Memorial, Thiepval, where Nelson is listed, is just a few kilometres to the north west. Nelson died, shot while with a colleague, attempting to bring his wounded platoon officer under cover. See report below. The diary of 12th Btn. has no details of casualties or the action being undertaken at the time of Nelson's death. The battalion diaries, held at the Regimental Museum in Gloucester, vary considerably in their content, both in the quantity of information and the amount of detail provided for the events of a particular day. Unfortunately, that of 12th Battalion is one with very little information for this period. However, there is detail of the events that lead to Nelson's death in the local press of the time and in a letter sent to his parents by a Company officer. 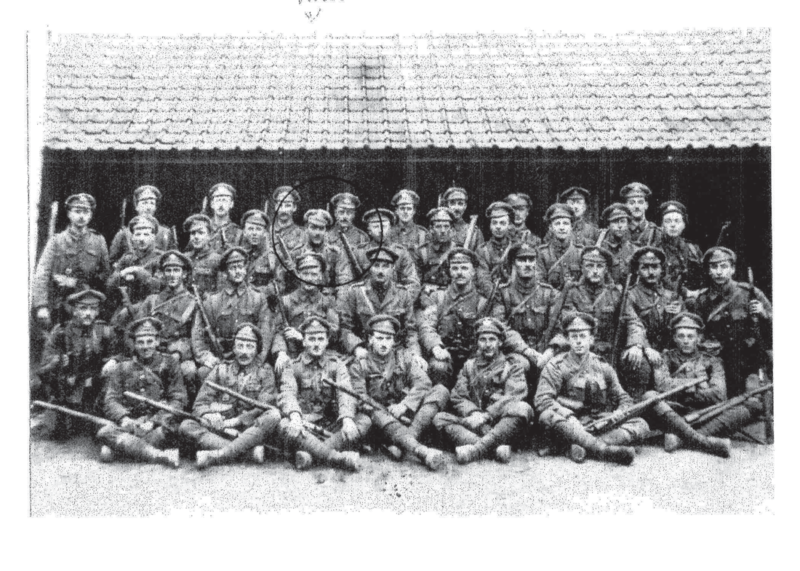 The following is taken from the Gloucestershire Regiment archives held at Gloucester. - Dursley Gazette, August, 1916". . . who was killed in France on July 29 in an heroic attempt to get his platoon officer, who was badly wounded, under cover. "Private Griffin was in his 20th year. He was employed by Messrs. R.A. Lister and Co. before war broke out, and enlisted in "Bristol's Own" on Dec 27 1914. This young hero bore the reputation of being a brave and fearless soldier, and was greatly liked by the officers and men of his regiment, by whom his death is greatly regretted. "He was a member of the Coaley Parish Church choir, and also a member of the local Bellringers' Association. In peace days he played in the Uley Brass band and Listers' Works Band, and was an excellent musician. . . . "
"I am writing to you on behalf of the platoon of which your son, Pte NF Griffin was a member, to express to you their deep sympathy on the loss of your son. I can assure you that we have all felt his loss most acutely, as he was quite one of the most popular boys in the company. "Speaking for myself I can only tell you that I always found your son one of the very best. He was always cheery and willing and never showed the slightest fear even when exposed to hot fire. I may not tell you where he was killed, but I may say that at the time he met his death he was helping to get our platoon officer, who was wounded badly, under cover. It may perhaps be of some consolation to you to know this for he undoubtedly met his death in an unselfish attempt to save another. I am afraid I have not expressed myself very well how much we miss your son, or how deep our sympathy is for you and Mrs Griffin, but I hope you will excuse me for this and will try and understand our feelings. . . . "
The officer whom Private Griffin and another fatality, Private Charles Blake of Portishead had tried to shelter was 2nd Lieutenant Herbert Ryland, who, while living and working in Jamaica, had enlisted as a private soldier in the Royal Army Medical Corps, and in that capacity had sent back frequent reports to the Jamaican newspapers concerning his experiences on the Western Front. 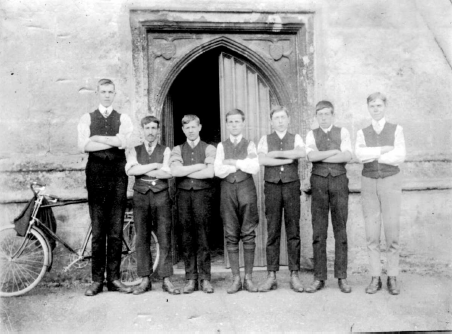 Later he gained his commission in the 12th Gloucesters, and after he was wounded his injuries were reported in both West Indian and Gloucestershire newspapers, he having his origins in the county. "Lieut. H. C. Ryland, son of Mr. T.H. Ryland, of Stow-on-the-Wold, was severely wounded on July 29. He got over the parapet of his trench with the object of leading his men forward, when the enemy immediately turned a machine gun on him, and he received the charge in his right hip, the femur being fractured. From then till August 1 he passed the time in field ambulances and clearing stations, and then he was admitted to hospital at Rouen, where he is being well attended to. At his father's request Bom. Raymond Alden, an old chum, visited him and found him quite cheerful." The battle of the Somme dragged to its conclusion in November, with little ground having been gained by the Allies. The pressure had been taken off the French army at Verdun, and the coalition held together. To the memory of my comrades of the 12th Battalion, Gloucestershire Regiment, (Bristol's Own) who gave their lives for King and Country in the 1914 - 18 war, and in particular Privates Blake and Griffin of C Company, killed in Delville Wood while carrying their wounded officer to safety. Greater love hath no man than this." After the death of Lt Ryland, his son, Christopher made a significant donation which enabled the creation of the museum's WW1 room which was named the Ryland Room in honour of his father. There has been discussion in the past as to why Ptes Blake and Griffin were not given a posthumus award in recognition of their bravery. It seems that such awards required the senior officer to make the appropriate recommendation. Perhaps there is a link between the lack of a recommendation being put forward and the degree of detail about the events of those days in July 1916 in the battalion diaries? Life for those in the Battle of the Somme were, without doubt, extremely dangerous, stressful and chaotic. Rung half-muffled to commemorate the life of Nelson Griffin who lost his life 100 years ago this day at the battle of the Somme. Prior to the war Nelson was a ringer at Coaley tower. On the 29th July 2014 2nd Lieutenant Herbert Ryland got over the parapet of his trench to lead his men forward when he was hit by machine gun fire. Private Nelson Griffin and Private Charles Blake went to Lieutenant Ryland’s aid and in the process both Privates were killed, the officer survived. The ringing followed a memorial service attended by Griffin family members, descendants of the Ryland family and members of the public. I think that was written by C Percy Brown, and after the 1939 – 45 conflict to get the description of the First World War. Nelson Griffin was killed during the war. IT WAS WITH GREAT SORROW THAT I READ THIS EVENING OF THE DEATH OF YOUR SON NELSON. THE NEWS WAS CONVEYED TO ME HERE BY ONE OF THE BOYS. I CONVEY MY HEARTFELT SYMPATHY TO YOU IN YOUR GREAT LOSS. THERE IS ONE GREAT COMFORT TO KNOW THAT HE DIED AS HE LIVED, A TRUE BRITISH GENTLEMAN. HE GAVE HIS LIFE FOR OTHERS AND "GREATER LOVE HATH NO MAN THAN THIS,THAT HE LAY DOWN HIS LIFE FOR HIS FRIENDS. NELSON AND I WERE AS BROTHERS, AND I HAD AMPLE OPPORTUNITIES OF NOTICING HIS GREAT WORTH. IT WAS HIMWHO STOOD BY ME THE DAY I WAS WOUNDED, AND DESPITE THE GREAT DANGER TO HIMSELF, HE HELPED ME TO THE COLLECTING STATION. HE DIED AS I AM TOLD IN GIVING AID TO OTHERS, THAT A GLORIOUS END TO SUCH A GOOD LIFE. MAY GOD BE NEAR YOU IN YOUR GREAT TROUBLE AND CHEER YOU, AND ONE GREAT DAY, WE SHALL ALL MEET. I THOUGHT I MUST WRITE THESE FEW LINES AS I MYSELF FEEL A PERSONAL LOSS IN NELSON'S DEATH. By way of introduction I am the eldest Grandson of E.D.Griffin from Coaley who was the younger brother of Nelson Griffin. I am sending this e mail to you to personally thank you and all the members of the Wotton Under Edge branch of the Gloucester and Bristol Diocesan Association of Church bell ringers for your efforts to try and trace the family of Private Charles Blake, so that you may bring the families together on the 100th anniversary of their passing at Delville Wood, The Somme, Picardy Northern France on Friday 29th July 1916. My Mother Maureen Wibberley (nee Griffin) informs me that the Bell Ringers will be ringing a 'half muffled quarter peal' in remembrance of the two men who so gallantly saved their wounded platoon officer 2nd Lieutenant Herbert Ryland at the expense of their own lives. Whilst I've had to research what this means (as I had no idea), it would have been known exactly by my Great Uncle Nelson as he himself was a bell ringer at Coaley church - this is entirely appropriate. I ,and we, in the Griffin family are so touched by this memorial to a member of our family whom we never met by people today, who I, and some others of us, have never met, completely restores my faith in the human spirit for doing good with acts of kindness and remembrance such as your members are doing. It strikes me that these young men who signed up to go to a foreign land to fight against a tyranny had very little, or no option, in making choices as they were sent 'over the top'. However both Private Blake and my Great Uncle Nelson did have a choice as to whether or not to abandon their C.O. or to risk the greatest danger in trying to save him. They both chose the latter thereby making the greatest sacrifice they could. Their selfless act of courage, with the tens of thousands of others from nations all over the world, gives us all here today the ability to be free to speak, to travel, to choose and to make decisions to remember or forget. I will be travelling to Northern France tomorrow as indeed will be my Uncle Robert ( the second eldest son of Dennis Griffin) and I will be at the Thiepval memorial on Tuesday 26th July to see their names. On Friday 29th July 2016 my wife Diana and I will be at Delville Wood at the place where they fell. Like you and your members we choose to remember. Whilst I am sorry I cannot be with you all on this particular date, please feel free to forward this e mail of gratitude to the many of you who are involved in this commemoration. I am profoundly grateful for what you are all doing for the families of Private Griffin, Private Blake and 2nd Lieutenant Herbert Ryland. HOPING IT WILL FIND YOU AND ALL AT HOME THE SAME. WE ARE HAVING SOME LOVELY WEATHER OUT HERE NOW, AND I THINK WE DESERVE IT TOO, AFTER HAVING THE BAD WEATHER WE HAVE HAD. HAVEN'T HAD MUCH TIME NOW, FOR WE ARE IN THE TRENCHES AGAIN, BUT BEING IN THE TRENCHES IN NICE WEATHER DON'T TROUBLE ME MUCH. HAVE BERT HEARD HOW MUCH HIS PENSION IS GOING TO BE. I RECEIVED THE PARCEL YOU SENT QUITE SAFE, AND THE THINGS WAS JUST WHAT I WANTED, ESPECIALLY THE PIPE, AND WILL YOU SEND ME OUT TWO OUNCES OF CHARMAN TOBACCO. DO YOU KNOW IF BERT CARTER HAVE COME OUT TO FRANCE AGAIN YET, OR IS HE WAITING TO COME OUT. AND REMEMBER ME TO HIS FATHER AND MOTHER AND TELL THEM WE ARE ALL AS HAPPY AS EVER. HAVE YOU HEARD HOW HARRY ELLERY IS GOING ON, AND ALSO GEORGE SMITH. WELL DEAR, I HAVE HAD A VERY NICE PARCEL FROM YORKSHIRE, AND I THINK IT WAS VERY KIND OF HER TO SEND IT, FOR I KNOW A PARCEL MUST COST A LOT NOW WITH EVERYTHING SO DEAR. IS THERE ANY MORE FROM COALEY WOUNDED OUT HERE LATELY, R. CROSS IS STILL ALRIGHT. I HAVE JUST HAD A LETTER FROM DOROTHY, AND HER BOY HAS JUST COME OUT TO THE FRONT. HOW IS GRANDMOTHER GETTING ON, IS SHE THE SAME AS WHEN I WAS HOME. WARWICK STATION, 11th AUGUST 1916. 16564. PRIVATE NELSON FRANK GRIFFIN, GLOUCESTERSHIRE REGT. on the TWENTY NINTH OF JULY, 1916. AND I AM TO EXPRESS TO YOU THE SYMPATHY AND REGRET OF THE ARMY COUNCIL AT YOUR LOSS.